There's a giant "ruler" hidden among millions of galaxies in the universe. With it, scientists can measure how fast the universe is expanding. This will help them explore dark energy, the mysterious power behind cosmic expansion, and so speculate on the universe's destiny. With this ruler, Chinese astronomers recently succeeded in reconstructing the evolution history of dark energy based on the observation of over a million galaxies. The research shows that dark energy is dynamic. "What it means is that dark energy, which causes cosmic expansion, might not be a vacuum energy with a constant density, like many scientists previously believed, but rather an energy field with certain dynamic properties," said Zhao Gongbo, a researcher at the National Astronomical Observatories of the Chinese Academy of Sciences (CAS). The research result made by a team led by Zhao was recently published on the academic journal, Nature Astronomy. Dark energy determines the universe's destiny, he said. "If dark energy is indeed a vacuum energy, the universe will keep on expanding until it ends with a 'big rip'. But if dark energy is dynamic, the universe might go through expansion, contraction and then expansion again -- a cyclical universe." How do scientists measure such a vast universe? According to Zhao, nature provides a magic ruler -- baryon acoustic oscillations. The early universe consisted of a hot, dense plasma of electrons, baryons (protons and neutrons) and photons, like a pot of porridge. The primordial disturbances from cosmic creation transmitted through the "porridge," causing periodic changes to its density, temperature and pressure on the chronological sequence. This transmission mechanism is similar to sound waves transmission, so it is called baryon acoustic oscillations (BAO) by scientists. About 380,000 years after the Big Bang, the cooled-down universe became transparent. The transmission of BAOs stopped, and the information of those oscillations is frozen in space-time. But the great power of it influenced the distribution of galaxies in the universe. In 2005, the BAO signal was discovered for the first time. 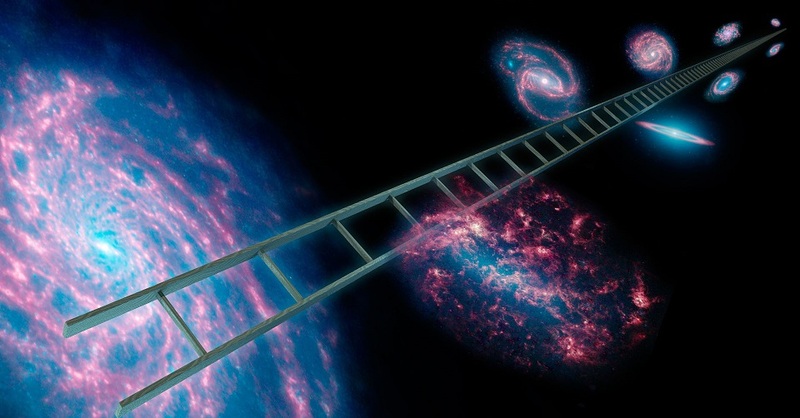 Thus cosmologists finally got the "standard ruler" they dreamed of, in order to measure the universe -- whether it's flat or curved, and how fast it's expanding. But that's just the start. Scientists also have to make accurate measurements. Since 2012, Zhao's team has been making observations with the Sloan telescope at the Apache Point Observatory in the U.S. state of New Mexico. Based on the observation of galaxies and quasars, they obtained high-precision BAO signals. "The observation of BAOs is becoming more precise. Previous observations focused on a short period of the universe, but we adopted a new method. Like doing a CT scan for a more remote universe, we get to know more about the history of cosmic evolution," said Zhao. Based on the measurement with the ruler, astronomers will be able to draft a three-dimensional map of the universe. In 1929, U.S. astronomer Edwin Powell Hubble discovered most galaxies are moving away from the Earth, indicating the universe is expanding. The discovery shocked the world, overthrowing the long-held perception of a static universe. But many scientists still believed that cosmic expansion would slow down. However, to their surprise, two research teams, in the United States and Australia, reported respectively in 1998 that they had discovered cosmic expansion is speeding up. Scientists assumed an unknown power they called dark energy was accelerating cosmic expansion. Even now, scientists still know little about it, although they have put forward many theoretical models. For instance, a model of dark energy advanced by Zhang Xinmin, a researcher at Institute of High Energy Physics under the CAS, conforms to the observation results of Zhao's team using the Sloan telescope. In order to test so many theories, large-scale computer simulations are needed. "With the help of China's Tianhe supercomputer as well as foreign supercomputers, we simulated approximately 2,000 universes for analytic purposes," said Zhao. On the computer screen, billions of years flew by, galaxies took shape and the universe evolved. "I want to understand why cosmic expansion is accelerating," said Zhao. "There is so much new physics in that. Normal matter only accounts for about 5 percent of the universe, while the other 95 percent of dark matter and dark energy is still unknown to us. If one day we know what dark energy is, the whole discipline of physics will be revolutionized." In the next five to 10 years, many projects will study dark energy on Earth and in space, both in China and abroad, he said. For example, China's future space station will contain a space telescope two meters in diameter. Its major scientific goal is to study dark energy.